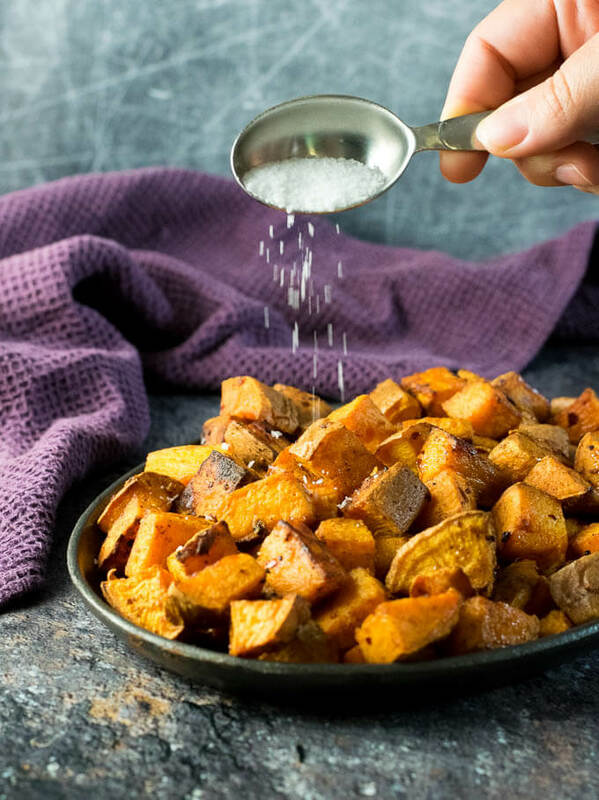 Roasting sweet potatoes in the oven is one of the simplest and flavorful side dishes you can feed your family. Keep reading to learn how to roast sweet potatoes to perfection! I spent the last week canoeing and camping in Minnesota’s Boundary Waters Wilderness and had a brief run-in with an ornery black bear. In the end, we reached a compromise and he let me live and I let him live. So I guess that worked out for all parties involved. Now back in civilization, I can’t tell you how happy I am to have exchanged my camp stove for my home kitchen again. It felt great to be back in my element roasting sweet potatoes in the oven. When perfecting how to roast sweet potatoes, the first thing you need to understand is the size of your chop will greatly influence cook-time and the final product. If you chop the sweet potatoes too large, they will take forever to cook. Too small, and they run the risk of burning. I recommend chopping them into 1″ pieces, they are perfectly bite sized and bake well. The ideal temperature for roasting sweet potatoes is 450 degrees. By roasting at this higher heat you are slightly charring the exterior of the chopped potatoes, adding additional flavor as the inside slowly cooks. You can roast at a lower temperature if you wish, however, the exterior texture will be mushier. For this reason, I also don’t recommend baking sweet potatoes in foil. The steam released during cooking will make them rather mushy. To prevent sweet potatoes from sticking to the baking pan, I like roasting them on a sheet of parchment paper. If your kitchen doesn’t already keep this stocked, take a few minutes to order some. Parchment paper is a baker’s best friend! Finally, feel free to get inventive with the seasonings. Any roasted sweet potato will need salt of course, but these are the perfect vessels for an array of additional flavor options. A while back I wrote a post featuring Urban Accents Seasoning and I now often use their seasonings to kick up the flavor on a lot of my foods. 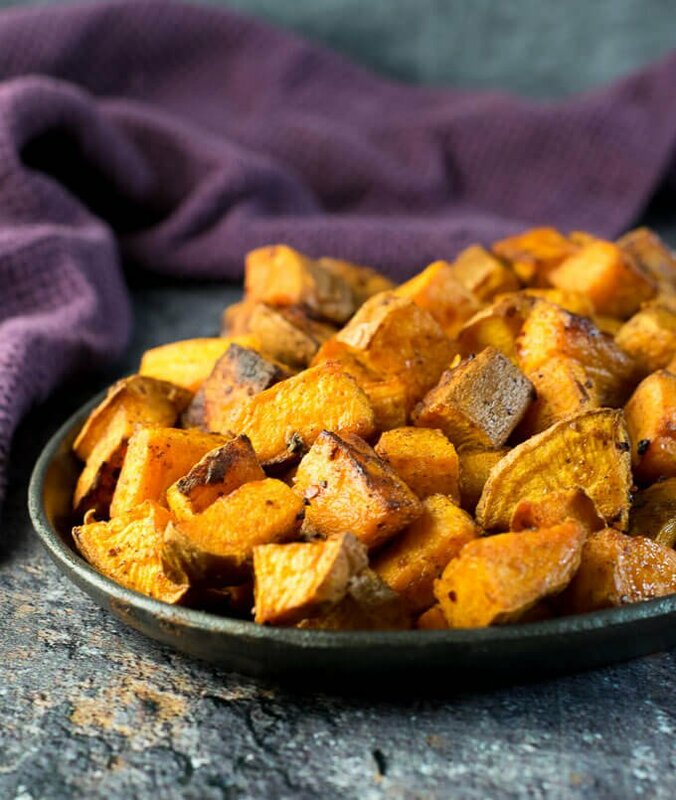 I used 2 tsp of their Mozambique Peri Peri to really rock these roasted sweet potatoes! 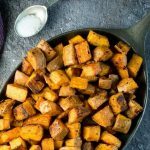 Roasting sweet potatoes in the oven is an easy way to prepare a healthy side dish everyone will love! 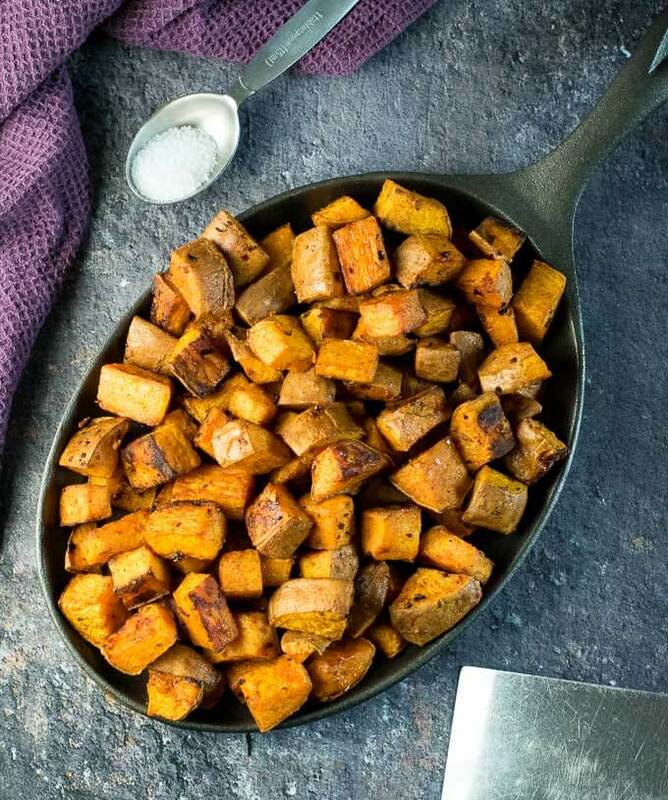 Add chopped sweet potatoes to a large bowl and drizzle with olive oil and seasonings. Toss to evenly coat. Pour sweet potatoes onto two baking sheets lined with parchment, spreading evenly to ensure even cooking. Place in the oven for 40 minutes, flipping sweet potatoes every 15 minutes with a spatula to prevent burning. IF YOU LIKED THIS RECIPE you will love my Chorizo and Sweet Potato Hash with Eggs! If you enjoyed reading How to Roast Sweet Potatoes then you should probably like me on Facebook and follow me on Pinterest too. That’s what I would do at least, because if you don’t get to know me but you still use my recipe it is kind of like taking candy from a stranger, and your mom taught you not to do that. Don’t disobey your mom, subscribe to Fox Valley Foodie today.